There will be several paintings in various venues in Ithaca for the month of November. First I will mention my Salon entry for this month at the Sate of the Art Gallery. It is a small landscape from my Sarasota Sunrise series: Sunrise #2 (two red bushes), 12×12″ acrylic on acrylic paper mounted on foam core and framed. I started this on a rainy morning this past January. As usual, I rose at sunrise, and it was a misty morning, with a slowly rising fog obscuring much of the near distance. It was a soft, dripping morning. I took a lot of photos, and did some pencil sketches, and then made a hasty retreat into the house when it started raining in earnest. After breakfast, I settled down and painted from memory and sketches. It needed some reflection and revision sessions over the course of the next few months, and voila, here it is, seeing the gallery lights for the first time. 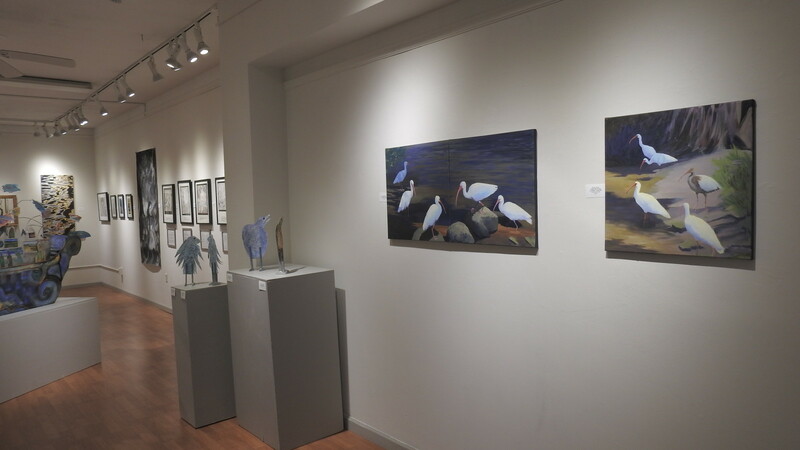 This Salon showing is in conjunction with Shirley Hogg’s solo exhibit Waiting for the Ark, large scale, life sized watercolors of endangered animals. 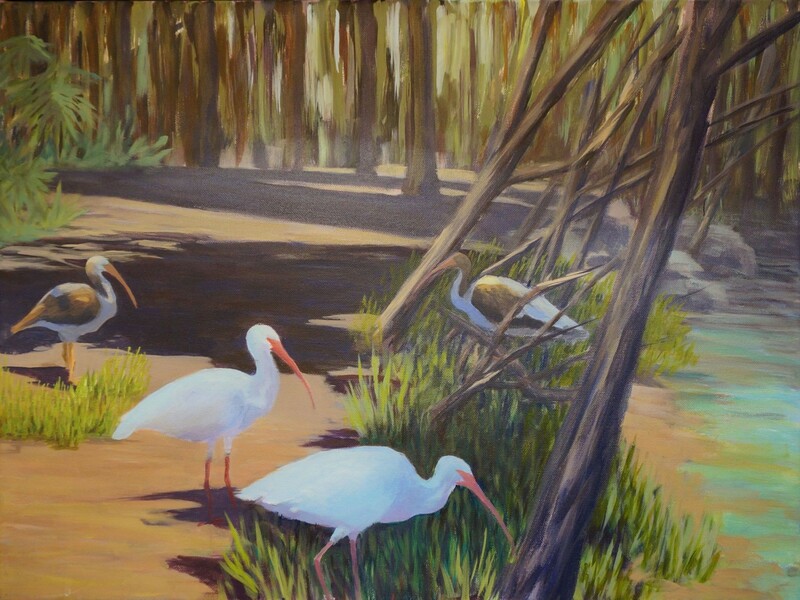 The show runs November 2-27, with a reception for the artists November 4, 5:00-8:00 pm. The State of the Art is located at 120 W. Martin Luther King/ W. State Street in Ithaca. Auction Fundraiser. Visual art will be exhibited in the gallery throughout November, celebrated with an opening reception on First Friday Gallery Night, November 4, from 5-8 PM. 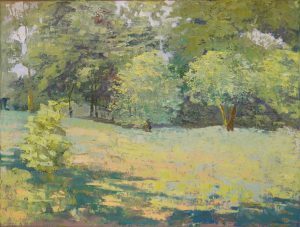 During the 18-day bidding period, works will also be posted on the auction website with a description, photograph, artist bio, and a link to the artist’s website. Silent bidding takes place entirely online. The Community School of Music and Art is located at 330 E State Street. Last, but not least, If you are visiting the physical therapy offices ofMcCune and Murphy in Trumansburg, you will see two 18×24″ landscape paintings. The first is a group of white ibis, adults and juveniles, in their natural habitat. It is done in acrylic, on stretched canvas, with brush. 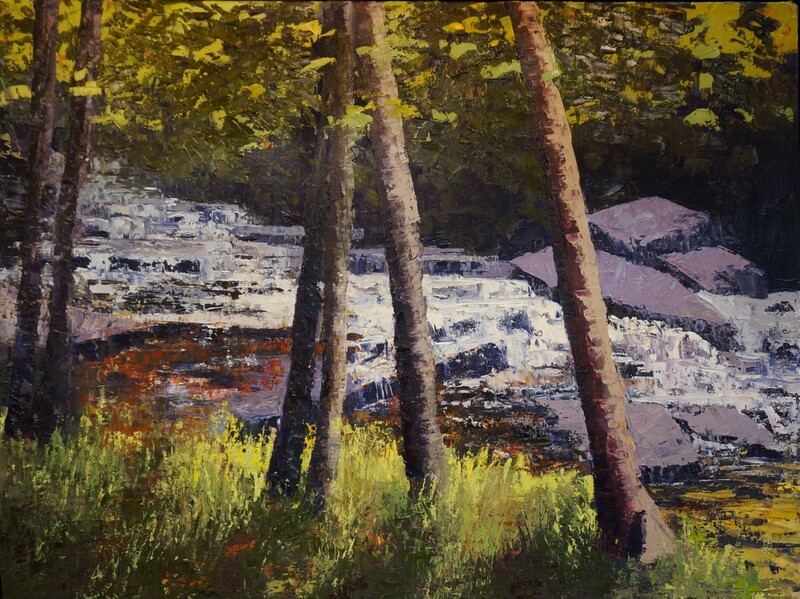 The second is Mad River, in Vermont, a landscape in oil done with palette knife. It will be there for an undetermined amount of time. 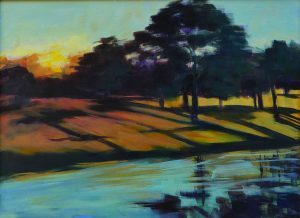 Sarasota Sunrise #1, 12×16″ acrylic on paper mounted on masonite. This month I have one new painting on display in the State of the Art Gallery. Sarasota Sunrise #1 is a small, 12×16 landscape done with acrylics. In February 2014 Andrejs and I took a respite from winter, visiting a friend in Sarasota, Florida. It was a delightful location, with a stream and a broad expanse of savanna (a golf course) in back of the condo. I got up at dawn almost every morning and did a painting of the sunrise from the lanai, which is the Gulf Coast term for veranda. I experimented with a different approach to using the acrylics. Using water and retarder, I made them much more fluid than usual, which freed them to flow much more with the brush strokes. Working over many days built up the rich color in these paintings. This is the first of this series to be exhibited. Stand by for more in coming months. For writers, a through line (or thru-line) is a connecting theme or plot in a movie, play, or book. It is a constant driving force that can take on a new dimension, shed another, or even make a detour all while maintaining a forward-moving trajectory. Applying this concept to art challenges one to articulate, visualize, and even problematize the driving force—the unwavering given – that defines one’s trajectory as an artist. Whether explicit at the outset of a career, evident incrementally in the details, or apparent only in hindsight, it is there: a thru-line defines the philosophical and material integrity of an artist’s work over time. 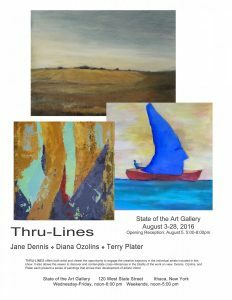 THRU-LINES at State of the Art Gallery offers both artist and viewer the opportunity to engage the creative trajectory in the individual artists included in this show. It also allows the viewer to discover and contemplate cross-references in the totality of the work on view. Dennis, Ozolins, and Plater each present a series of paintings which shows their development of artistic intent. 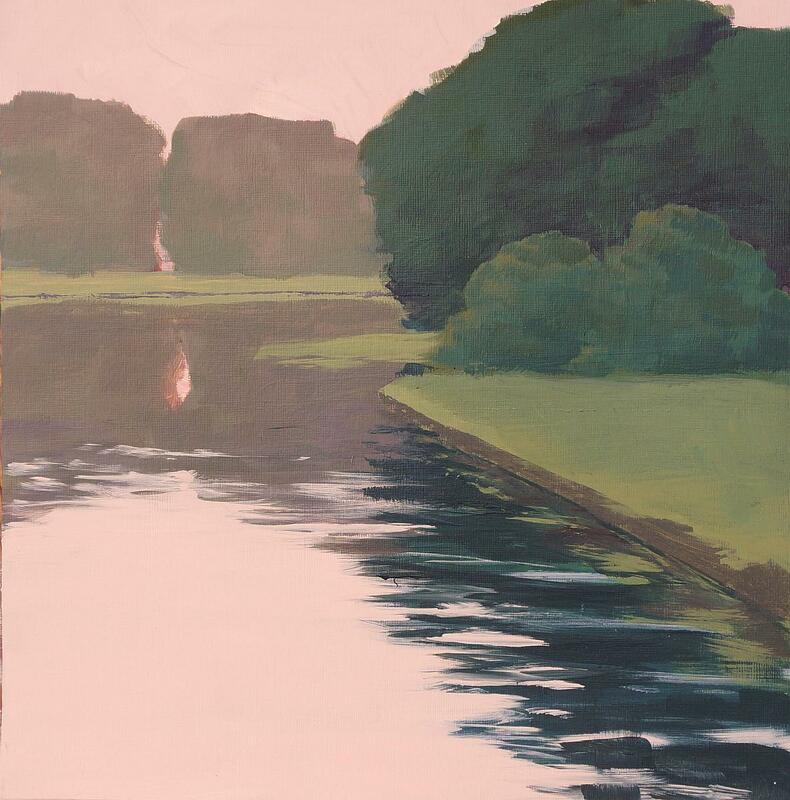 .This has been an unusually busy spring, so I haven’t been painting out and about as I would ordinarily. 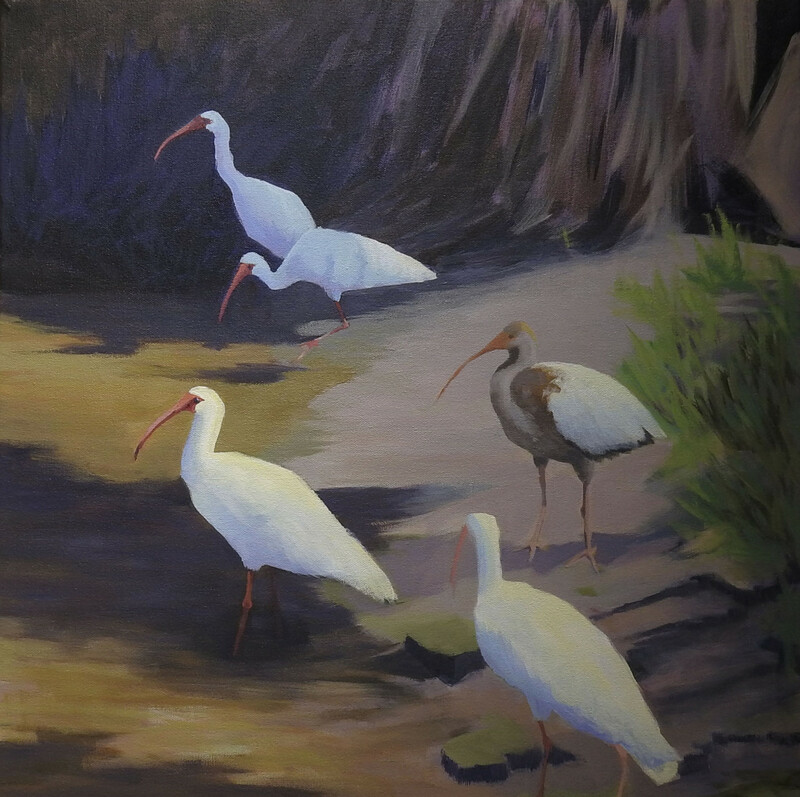 Among other things, I have had to discipline myself to stay in the studio long enough to finish the abstract color exploration series, and the four Ibis paintings. However, I did get out with a group of painters, on what turned out to be a blustery day with drizzle on and off, to a beautiful spot – Belle Canto Farm – owned by the sister of one of the painters. 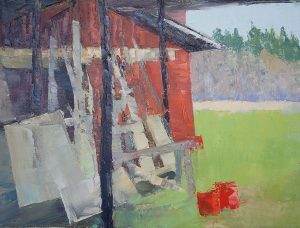 We had to to paint in shelter, and I chose to stand in the feed shed, a wonderful red structure, which contrasted with the fresh young green of the grass, and filled with an assortment of boards and odds and ends. scientific avian illustration, but a convincing painting of birds as we see them. I do want them to feel right. I made two more trips to Florida in the succeeding years, Each time I had many opportunities to observe, photograph, and sketch. Each time I returned to my studio better equipped to continue refining the figures, I am pleased to finally be able to share them. The show opens on Wednesday, May 4, and runs till the end of May, There will be a reception on Friday, May 6, 2016 from 5-8.